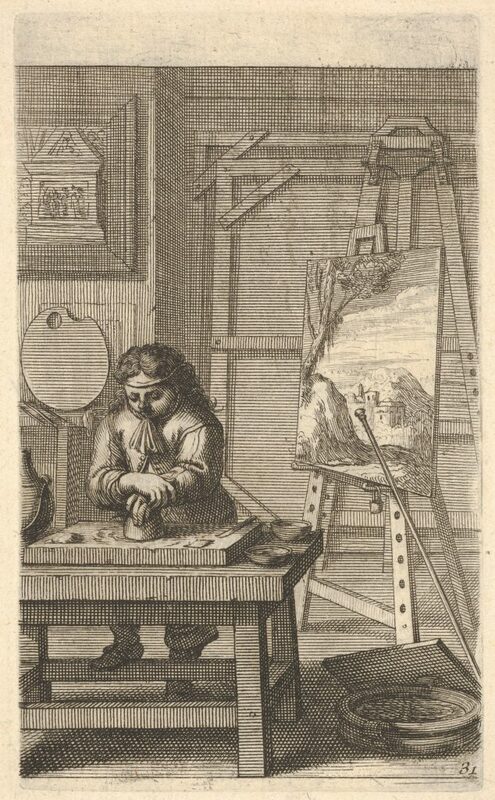 Copperplate etching from 1667 by the Fench artist Abraham Bosse (1602-1676). A museum entitled it A Painter in his Studio and a blogger named it An Artist Grinding His Colours. Clearly, both are good descriptions of this piece. We’ve been so spoiled. Need new materials for an art project? We just head off to the nearest art store, department store or place an order with our favorite online retailer. But, back in the 17th century, artists had no such conveniences. We’ve so spoiled. Need new materials for an art project? We just head off to the nearest art store, department store or place an order with our favorite online retailer. But, back in the 17th century, artists had no such conveniences. They wanted new paint; they had to make it themselves. Early artists had to develop their own pigment sources and use them to create their paints. Berries, nuts and all sorts of things would provide the colors for their work. During the time Bosse was alive, artists might rely upon the local apothecary for the pigments. But, the artist still had to grind those pigments before blending them with walnut or linseed oil. Artists ground the pigments on a stone slab with a muller. (Muller is simply an art term for a flat grinding stone.) The finer they could grind the pigments, the smoother and more uniform the paint. Just thinking about having to create their own paint in this way makes me wonder how it interrupted their creative flow. Instead of squirting a bit more of this or that color onto their palette from a tube, they would have to stop painting and grind their pigments. In Bosse’s work, we can see a palette standing on a shelf. At that moment, it’s more a decorative item than a tool for the artist. An incomplete painting sits on an easel awaiting the new details that will be created with the new paint. I’ve not found a great deal of information about this artist. Like all of the artists featured on The Famous Artists, I do have a biography of Abraham Bosse. You’ll learn about the artist, his life and see more examples of his work.